Refugees Welcome Milton Keynes is a charity registered in England and Wales (No. 1171591). To relieve financial hardship among those seeking asylum and those granted refugee status particularly by the provision of support, advice and translation services. According to the British Red Cross, there are more than 15 million refugees world-wide, mainly from war zones including Syria, Afghanistan, Somalia and Sudan. In 2015 the UK received nearly 39,000 asylum applications of which less than half were granted. Nearly 120,000 refugees live in the UK – that’s 0.18 per cent of the total population. What’s Milton Keynes Doing About It? Milton Keynes was quick to offer all–party political support to refugees and for our work to help them. Labour, Conservative and LibDem party leaders are patrons of RWMK. Thirteen families have settled in with our help and we expect more to arrive as part of the government’s commitment to welcome 20,000 Syrian refugees into the UK by 2020. Funding for this comes direct from central government and not from the local rates. Who’s a Refugee, Who’s an Asylum Seeker? What’s the difference between the terms refugee, asylum seeker and migrant? 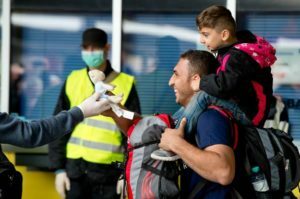 Refugees are in the UK legally and with the right to work, having satisfied the UK authorities they would be at risk if returned to their home country. Asylum seekers have sought protection as refugees but their claims have not yet been assessed. Migrant is a description covering anyone moving from one country to another to seek a better life. They may or may not have a legal work permit. We work with refugees and asylum seekers . We work with MK Council and the local branch of the British Red Cross (BRC). The BRC provide the day–to–day support for the families including language learning, interpreting and transport needs. BRC have also taken over the responsibility of setting up the homes for new families, and we continue to look for organisations (faith groups, businesses, clubs or others) who are willing to fundraise to cover the cost (£3500) of furnishing ‘Just One House’ and, if possible, also to introduce volunteers who are willing to train to support the families as buddies. We also buy equipment and materials, provide modest grants, encourage integration and do public relations work to highlight the needs of refugees and asylum seekers. This includes a Talks Team happy to be invited into your school or organisation. If you would like to find out more, please see our Schools/Education page for more details including how to get in touch with the Talks Team. Our partners need your support in the work they are doing. Learn more about our work: sign up for our regular newsletter. At this point, we’re not looking for new ideas. We’re looking for leaders and doers – people who can step up and make a difference. We need active trustees, capable administrators, and people passionate about making a difference.